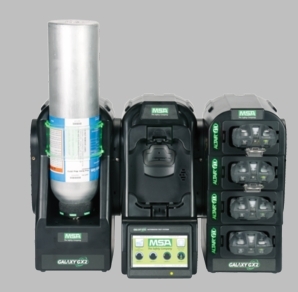 The MSA GALAXY GX2 System Test Stand comes with pre-configured plugs, barbs, fresh air filter, power supply with corresponding plug, spare parts kit (gas tubing, barbs and plugs), Ethernet cable (short cable for connection between test stands), and screen protector. MSA 10128627 Galaxy GX2 System Test Stand is suitable for use with Altair 5X multigas detectors and its predecessor the Altair 5. Model 10128627 is a 4 Valve unit for use with 1-4 calibration gas cylinders. The MSA 10128627 System Test Stand is NON-Charging.